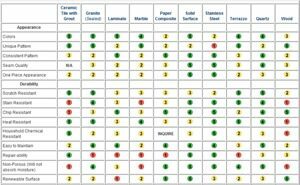 View our Countertop Comparison Chart to help you with your selection process by giving a general overview of the most popular countertop surfacing materials. Please keep in mind that this countertop comparison chart is not a perfect analysis of all materials. Be sure to consult with one of our Design Experts to get more specific details on each of the countertop surface types. Choosing a new countertop for your kitchen or bathroom can be daunting. You have to factor in durability, cost of the material plus installation, as well as how it will harmonize with your home’s decor. 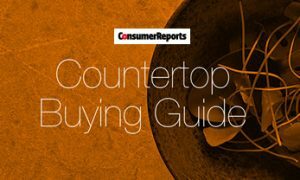 To find out the pros and cons of the countertops you’re considering, especially since materials can be comparable in price, be sure to keep this guide handy.